There’s so much pressure on teenagers and young adults these days to figure out their lives and decide right then and there what their lives will be like. College, military, working their way up with good old hard work and dedication. Doesn’t matter what they pick, but they better pick something! Hurry up! Quick! Make it happen! But to be truthfully honest, many never really figure it out, and some (like myself) don’t figure it out until the twenties are in the rearview window. But even in the knowing what we want, actually doing it is well… a completely different story entirely. Doubt is like a disease. It eats away our confidence, our empowerment, our entire lives. It can leave us broken, sick, and disgusted. Doubt, left unchecked and rampant in our lives, can be the true death of us. See all those people on autopilot with vacant expressions and a flurry of bad attitude, stress, and negativity? Were they too once dreamers of a hope to become something else beautiful but were beaten down by the overwhelming darkness of doubt? I used to be one of those zombies, but before I was the walking dead, I too had a dream, a desire, a hope. I feel the tug. I feel the despair. I feel the doubt, nipping away at my energy, my hope, my potential, my all. But I’ve been to Zombie Town and don’t want a revisit. I want to be the person I was always meant to be. But do I have the strength to resist the darkness from with in? How can I be the person I want to be, when doubt lurks in every direction I turn? I recently read a fabulous series by T.A. Barron about the legendary Merlin, starting with Merlin: The Lost Years, but it’s the fourth book The Mirror of Merlin (or the more recent title The Mirror of Fate) that I often think on (warning, if you haven’t read the series SPOILERS AHEAD). The young coming-of-age wizard steps through a magical mirror to meet his much older and wiser future self and that’s when the five book sage takes on a drastic turn. Up until this point in the series, the new wizard has been told by several respectable people that he will become a wizard like no other. His powers will be so great that he will learn how to live backward in time. A fascinating thought, but highly unbelievable. And yet it did (at least based on T.A. Barron’s books). In meeting his older self, Merlin got to see who he would become. For the first time ever that destiny carved out for him seemed real and possible, not because of his belief in himself, but because he saw it already played out right before his eyes. This hardened, wiser, wrinkled old man had already lived the life he was destined to live. It’s kind of hard to disbelieve with that sort of blaring fact staring you in the face, so naturally when he went back to his own time, Merlin was a changed man. No longer did he doubt himself or his abilities, because he had already done it. So no matter how impossible the situation (and the fifth books has a lot of those! ), or how bad the odds, Merlin stood his ground. He truly believed in himself and made great things happen. 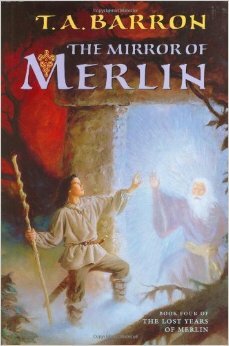 He was no loner the scared, uncertain boy, Merlin had become a confident and empowered man. So how do we find the empowerment in ourselves? Must we too face our own mirror? Must we take a giant leap into the future to meet our wiser, older selves? Would anyone really want to know the truth of what they become? Because the possiblitiy of becoming less than what we want can be all too real a possibility as well. It’s kind of hard to come back from knowing you’ll be a complete failure and die alone and unaccomplished in anything of importance at all. Yikes! Just writing that last sentence makes me depressed! Thankfully, the future remains veiled. Our possibilities are endless and hope remains bright even among the black void of doubt. Our mirror instead must be forged in our minds and in our intentions. Because our intentions are everything! Belief in ourselves only remains strong if we feed it. Do you want to be the best you can be? Then remind yourself who you are, what you can do, and where you want to go. Reinforce it with notes or signs where you can see them everyday. Be more mindful of your actions, your thoughts, your everyday intentions. Be more positive, resist the Zombie tendencies of being on autopilot. Feel alive by doing something fun, new, and exciting. Love with all your heart. Smile like it’s your last day on Earth. And be thankful for all the things in your life from the big to the small. Live in the moment and allow yourself to just be. And in those moments of fun, love, and just being, you will discover that magically the doubt isn’t as strong as it used to be and your life is taking on a shape that you’ve always wanted it to be. I myself don’t care to be rich or popular or a person of great persuasion. I just want to be a good person. I want to be loved and appreciated by those closest to me. I want to live a full and enjoyable life. I want to spend the rest of my days reading and learning new things. But mostly I want to be a writer. Preferably a great, beautiful writer like T.A. Barron whose words are truly, perfectly magical. But as long as it’s writing, and it’s the best of my ability… that’s okay too. So the only question that remains is… who do YOU want to be?